Mr. Jeremy Corbyn, the leader of the UK’s biggest opposition party Labour, has been known for his far-left ideologies ever since taking leadership of the party back in 2015. As most believed he would only serve as Labour party leader for a short while, none thought his open sympathy for the Palestinian cause would ever come back to haunt him. However, given Prime Minister Theresa May’s poor performance as the UK’s leading politician, Labour has seen it’s possible to vote share rise in polls recently, and Mr. Corbyn, who has held on to his position far longer than expected, has come under the intense spotlight. As Ms. May oversaw the departure of various senior Tory politicians disgusted at her Brexit plans, many in the UK media have started to realize Mr. Corbyn actually has a fair chance of becoming Prime Minister one day. However, his chances received a dent this week when pictures emerged from a 2014 Tunisia trip, taken one year before he was voted as party leader. In those, Mr. Corbyn can be seen alongside two known terrorists. 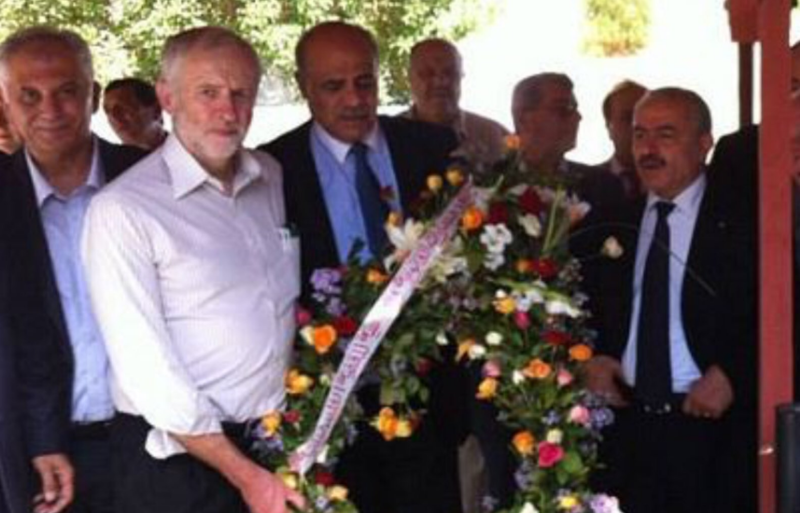 Standing next to Mr. Corbyn is a senior official from a terrorist group that murdered a British rabbi in a Synagogue attack a month later, Mr. Maher al-Taher (the leader-in-exile of the proscribed Popular Front for the Liberation of Palestine or the PFLP). Related coverage: <a href="https://thegoldwater.com/news/18778-UK-Press-Opposition-Corbyn-Could-Be-PM-If-He-Abandons-Brexit">Corbyn could be PM if he abandons Brexit</a>. That picture has led to consternation in the British press for two days now. And this morning, it would seem Mr. Corbyn was also pictured alongside Ms. Fatima Bernawi at that Tunisia visit, a terrorist who received a life sentence for trying to blow up an Israeli cinema in 1967.